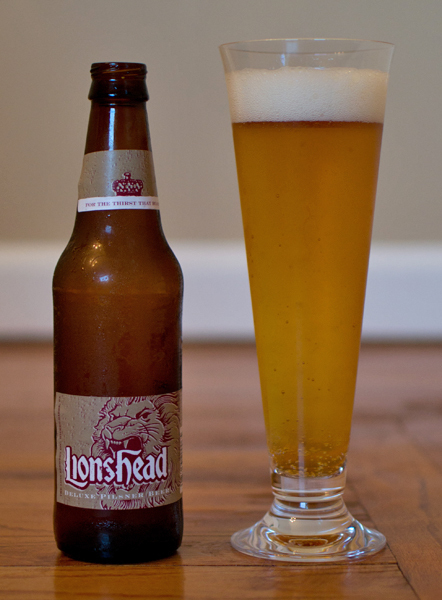 Beer #149 – Lionshead Pilsner by Lion Brewery, Inc.
Lionshead Pilsner by Lion Brewery, Inc.
Short and sweet tonight as I have company over. Beer #149 is Lionshead Pilsner by Lion Brewery, Inc from Wilkes-Barre, Pennsylvania. Brewed in the style of an American Adjunct Lager, it has an ABV of 4.5%. I broke out the Lenox pilsner for this pour. It was a clear gold color with a nice frothy white head. The nose was grassy, grainy and slightly skunky. There was a bit of a lemon aroma there too. It mostly had a malty bread grain like taste with a bit of lemon. None of the skunky smell was present in the taste. The mouthfeel was very light and crisp…dare I say refreshing? This is really easy to drink…almost too easy as the bottle was gone very quickly. This brew was OK…not great and not a down the drainer. Jhoom by Yuksom Breweries, LTD.
As I was cruising through my local beer store looking for something north of the border to try (Unibroue in particular), this beer from India caught my eye. I should have known from the name of the brewery, Yuksom, that this was going to be a…yucky beer. I apologize Unibroue, I will get back to your beers soon. 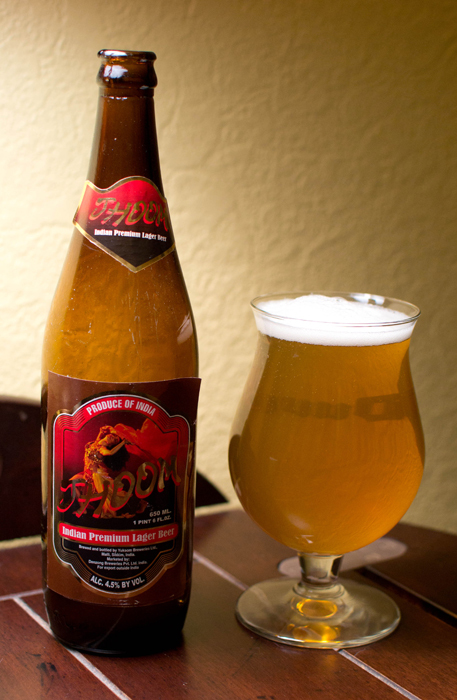 Beer #75 is Jhoom by Yuksom Breweries, LTD. and comes from the same country, India, that brought us the Taj Mahal and Gandhi among other things. This is an American Adjunct Lager (think Bud, Coors, Milwaukee’s Best, crap…did I just say that?) with an ABV of 4.5%. To me, American Adjunct Lagers are the bottom of the barrel in the beer world. Some don’t even consider this style beer. Most of us in the United States have probably had plenty of these when we first started drinking. I know I did. This style of beer was made popular after Prohibition by the major breweries using adjunct cereal grains like rice and corn. Now we all know beer should be made with 4 ingredients, water, hops, barley & yeast. Notice there is no mention of corn or rice in there. Hence, that is why some don’t consider this style real beer. It is quite a shame that it is the most popular style of beer in the United States. Enough of that, on to Jhoom. Jhoom poured a hazy pale yellow with a very small foamy head that quickly disappeared. The nose smelled like corn flakes when it was cold but as it warmed up, it smelled like urine or like a toilet as my wife noted. Not good at all. It tasted like absolutely nothing. There was something there I was picking up but what exactly it was I couldn’t identify. It was very watery with little to no carbonation what so ever. I guess it would be easy to pound these down with the low alcohol content and the watery consistency but really, why would you want to? Yuksom is a great name for the brewery since this beer is…yuk. Stay away…stay far away. The only good thing that came from this experience was that I have had a beer from India. Although it may make me question ever having another beer from India. Interesting to note that in 24 hours I went from one of the best beers I have ever had, Pliny The Elder, to one of the worst, Jhoom.